The Short Version: Godzilla roars a second time on North American shores, but it takes him an hour to get there; and even then, director Edwards doesn't allow the camera to stay on him long till the last 10 to 15 minutes. Reduced to a supporting player in his own movie, Godzilla looks good, and does the Tokyo Tango in San Fran with a happy couple of MUTO (Massive Unidentified Terrestrial Organisms), but if you've seen the directors talky, people-populated MONSTERS from 2010, you will have an idea what you're getting here. Once the smoke has settled, and the fires extinguished, an entertaining movie lies underneath all the incessant talking and rubble. The nods to the elder series are a nice, welcome touch, so it's not like the director isn't a fan. There's much to like here, and as much that's problematic, but on the whole, it's a good monster movie, just not a great one. 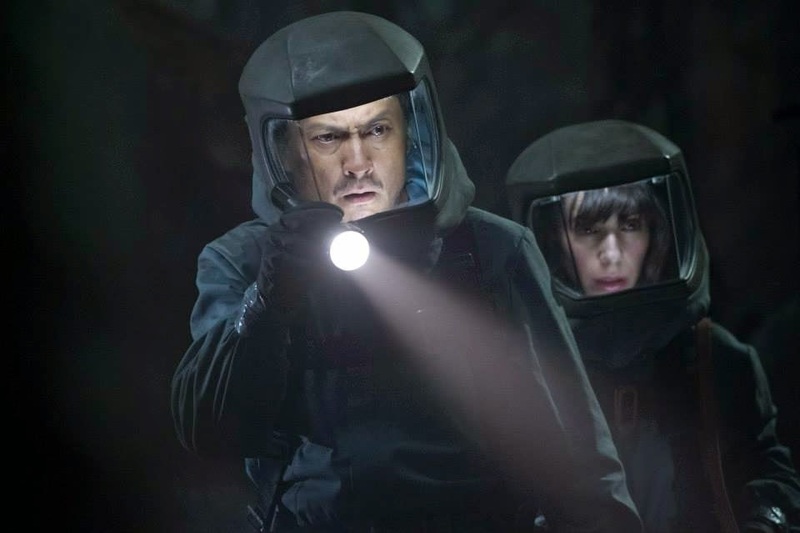 Scientist Ishiro Serizawa and his partner are notified of a massive skeleton discovered in an underground cave in the Philippines. Upon descending into the depths of the chasm, they find two egg-like formations that appear to harbor parasitic life forms. It also appears that one of them has hatched. Soon after, a catastrophe occurs at a Japanese nuclear power plant resulting in widespread damage, loss of life, and the area being cordoned off from civilians. Fifteen years later, one of the power plant survivors and his son learn there is more going on in the alleged quarantine zone than the government is willing to tell. 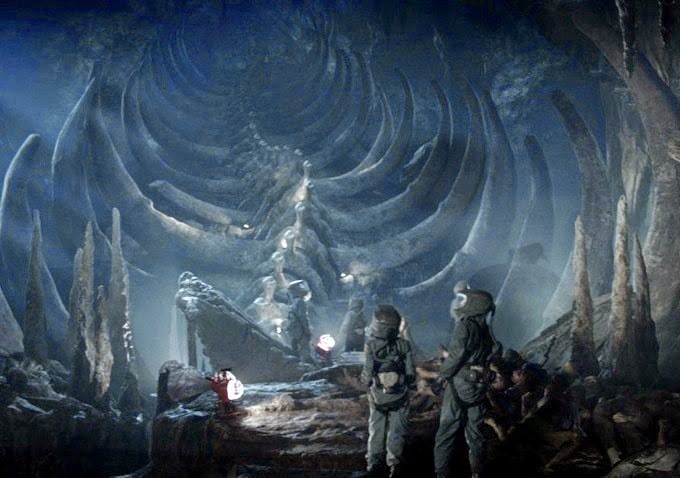 The hatched subterranean life form is being studied in secrecy. Eventually it escapes and it's quickly learned that another, larger monster is out there, as well as still another well kept secret -- an ancient protector of the Earth, Godzilla. Japan's mightiest monster marches on American theater screens in loud, boisterous, and epic fashion after having went on hiatus in his native country back in 2004. 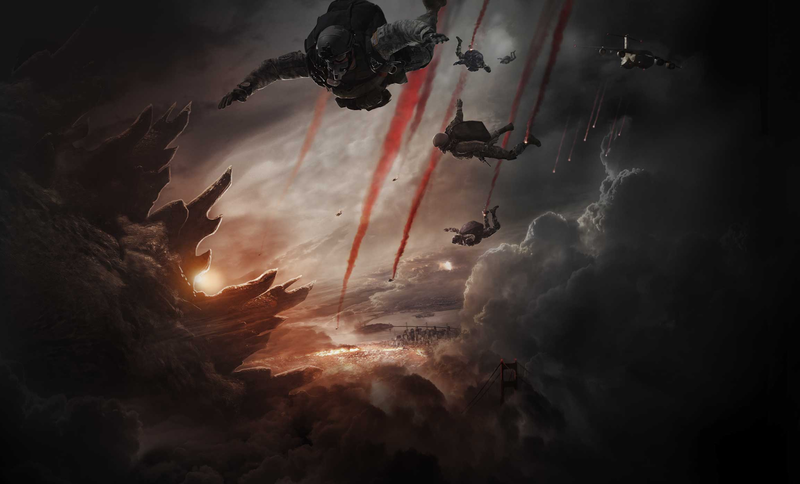 After a disastrous Godzilla misfire in 1998, Warner Bros./Legendary Pictures gambles $160 million on the property, handing over directing reigns to British filmmaker Gareth Edwards. Getting the job after making an impression with an utterly boring movie from 2010 titled MONSTERS (of which there were very little), Edwards lets loose his expositional propensities on a genre not known for giving the bulk of its screen time to human characters all the while putting their moneymakers in the backseat. While his take on the iconic monster is moderately less gabby compared with his earlier effort (there are far more characters that get to talk, talk, talk), the actors once more take precedence over the monsters. 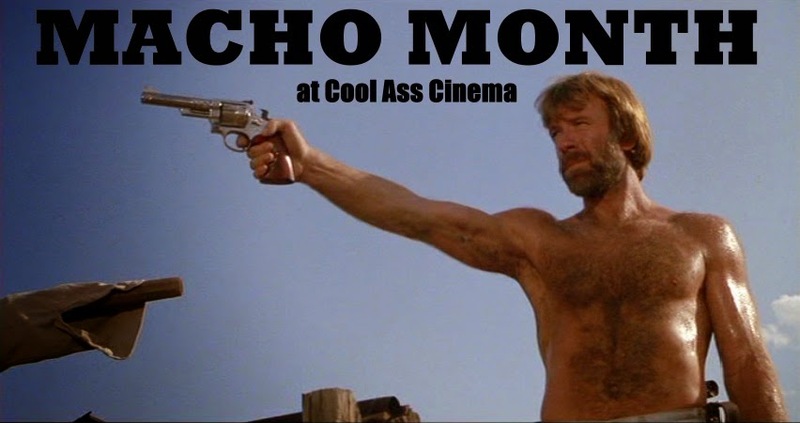 This should come as no surprise since the King of the Babblers, Quentin Tarantino, is among the directors influences. Occasionally something happens in GODZILLA to remind you that you are in fact watching a monster movie and not a drama about a family crisis. Eventually the gigantic antagonists of the film, the MUTO, shows itself (Massive Unidentified Terrestrial Organism) and we hear a bit about the monster this movie is named after, but we don't see him till the film is half over. Much like the Hammer Dracula pictures with Christopher Lee, Godzilla is reduced to being a supporting character in his own showcase. The necessity for suspense applies in the case of the parasitic MUTO, but everyone has a general idea what Godzilla looks like already, so keeping him hidden for an hour was unncessary. With two US Godzilla movies made now, this second incarnation makes one thing immediately apparent in comparing East and West: In the Japanese productions, the monsters are the stars. They're window dressing in Edwards vision. 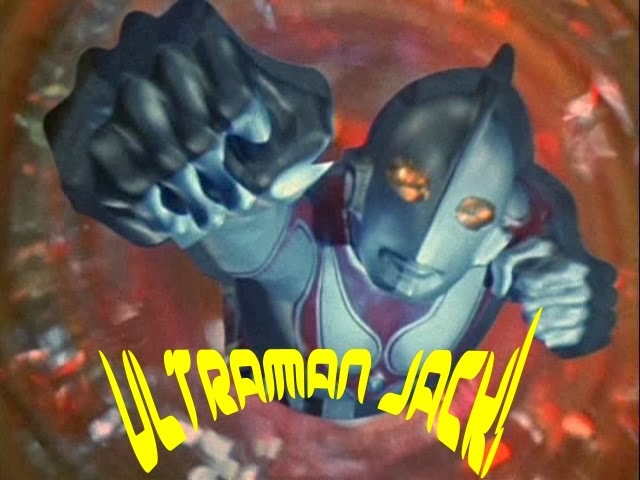 The Showa Era films, especially those directed by Ishiro Honda, found a balance between the humans and the monsters often finding ways for them to interact, or, in some cases, even work together. The Heisei films, for the most part, favored the creatures with little human interaction at all. 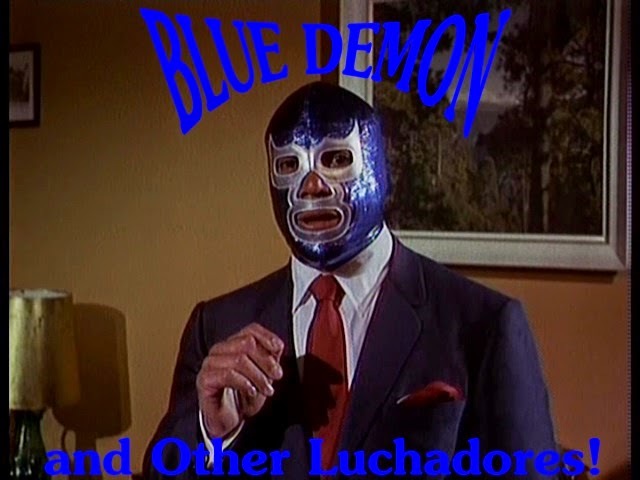 This new movie goes in the opposite direction. During the monster sequences, Edwards cuts away from the monsters, and back to the people with frequency. Along with screenwriter Max Borenstein, they have essentially made a movie that starts off like a traditional monster picture, then quickly descends into disaster machinations about an imperiled populace threatened by a living, breathing catastrophe. The monsters are then turned into obstacles which the human cast must overcome till the finale when the film is finally handed over to its star attraction. On three or four occasions we're teased with a monster battle, but Edwards shies away from it every time. 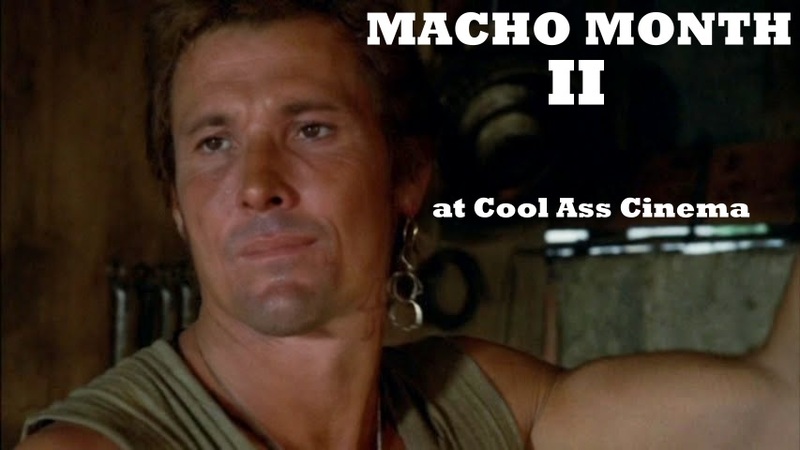 He either cuts to the Brody's and their predicament, or goes back to the military talking about what they're going to do, how they're going to do it, etc. We get lots of scenes of characters in peril, or the MUTO moving past them leading into a precarious situation; but an actual monster vs. monster skirmish doesn't come till the finale, and even then, Edwards can't help but cut away to people again. What's most confounding is that for all the talking scenes given to military personnel, there's very little military vs. monsters, either. Yet again, talking is the method of choice. There's simply no balance between the monster action and their interaction with the characters. 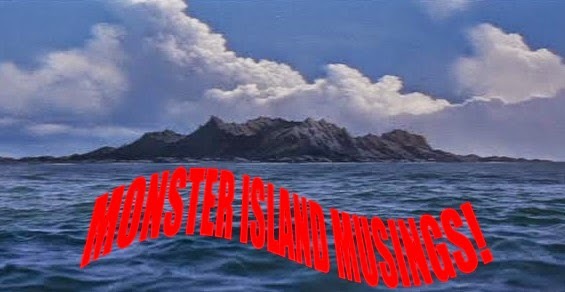 Regarding the monster sequences, what's there is pretty spectacular. Drenched in smoke and fog, these scenes are given a Gothic flavor -- particularly those in the city. Given his limited screen time, Godzilla looks very impressive when we're allowed to see him. There are even a few shots (at a distance) where Godzilla looks less like a CG creation than one brought to life via suitmation. 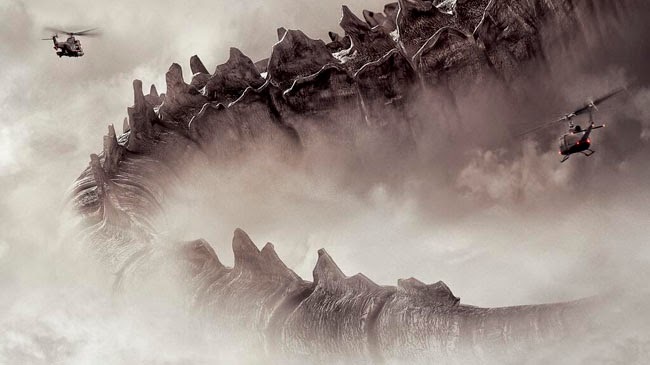 This new 2014 design easily surpasses the '98 travesty, although Godzilla's head seems tiny, and the big boy appears to lack feet. So hopefully he'll be granted a real pair of stompers in a sequel should one be made. There's one shot in the movie where the King of the Monsters looks as indomitable as he's ever looked. Other than his apparent lack of feet, Godzilla's flame attack has an equally long wait time till we see it; only in the last few minutes does he use it, and when he does, it's lukewarm to put it mildly. As loud as the movie is, it's odd the Big G's flame attack isn't given an equally noisy sound effect. 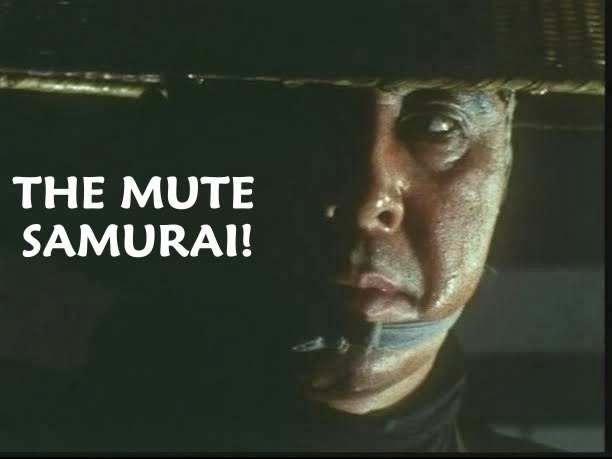 The second time he uses it, it's utilized well in the context of the scene, and arguably, this is the single most satisfying shot in the entire movie. The MUTO monsters are an imposing duo. One of them is a flying beast, and smaller than the other larger, land roving monstrosity. Both monsters resemble Earth-born relatives to the CLOVERFIELD (2008) alien. The flat surfaced, triangular-shaped head favors Daiei's Gyaos (in their GAMERA series), especially the flying one. Unlike Gyaos, the MUTO don't like the taste of humans, and only eat food high in nuclear calories -- like bombs and stuff. Incidentally the MUTO get more screen time than Godzilla. For all the calamity they bring, you'd expect to hear the monsters (between 300-400 feet tall) coming a mile away. Apparently Edwards' version of daikaiju have ninja skills. These giants stealthily sneak up on each other, and even the cast members, despite their gargantuan size. 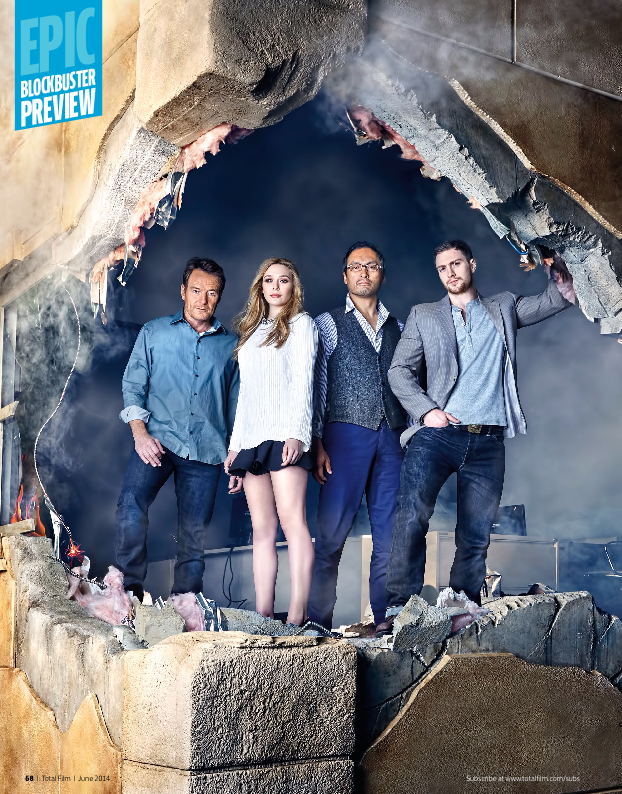 Aside from the monsters, the cast of characters are fine. Other than Emmy winning Bryan Cranston, nobody else really stands out, even though everybody gets to spout off their fair share of dialog. Cranston gets heavily into character so much, he'd do great in an actual Japanese monster movie with his intensity and heavy dose of melodramatics. 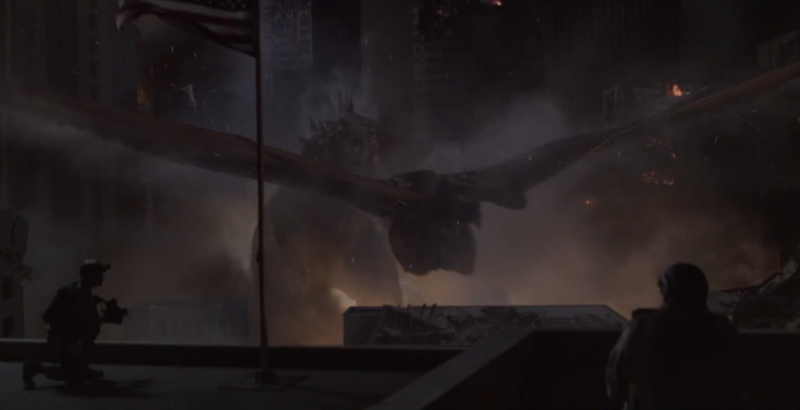 Arguably the biggest disappointment of GODZILLA 2014 is the cutting of Akira Takarada's scene. 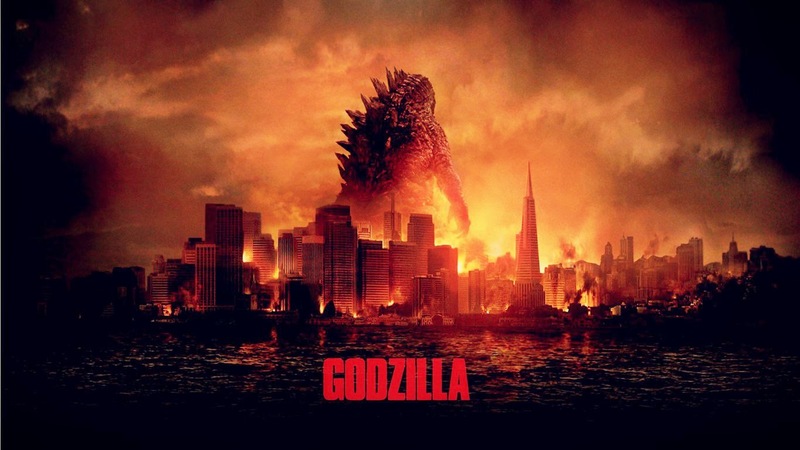 The actor, who had been campaigning for a role in the film since 2010, is as vital to the series as Godzilla is. Imagine having pushed to gain a role in a film for a series synonymous with your name, then get said role, only to later have it cut from the finished print. What makes it so baffling is that Edwards' explanation was that "there was a lot of pressure to get on with the adventure and get to the monsters, you know, as soon as you can." The problem is they don't get to the monsters as soon as they can; especially not the main one. And since Takarada is the lead star of the 1954 original, it only seems logical that he should be in this film; even better if he'd been cast as Serizawa instead of Watanabe. Other than Watanabe's Serizawa name, there are a few other nods to Toho's series; mostly in that Godzilla is depicted as a protector of the planet. He seems even less interested in trampling people and buildings as his light-hearted 60s incarnation did. 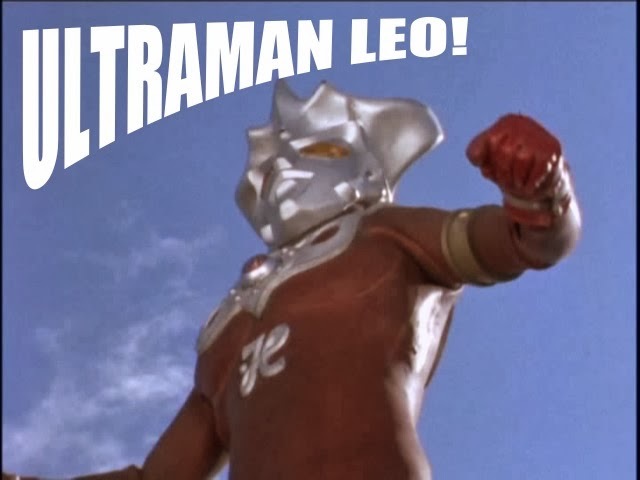 There's even a trace of Gamera-esque emotional attachment to humankind lurking below the depths of the script. There's a Japanese giant monster poster on the wall in little Ford Brody's room. There are two Mothra references -- one in a Japanese classroom depicting butterflies on a poster, and the name 'Mothra' on a tank in Brody's dilapidated house. The director even saw fit to plaster his last name on the side of a jet plane! 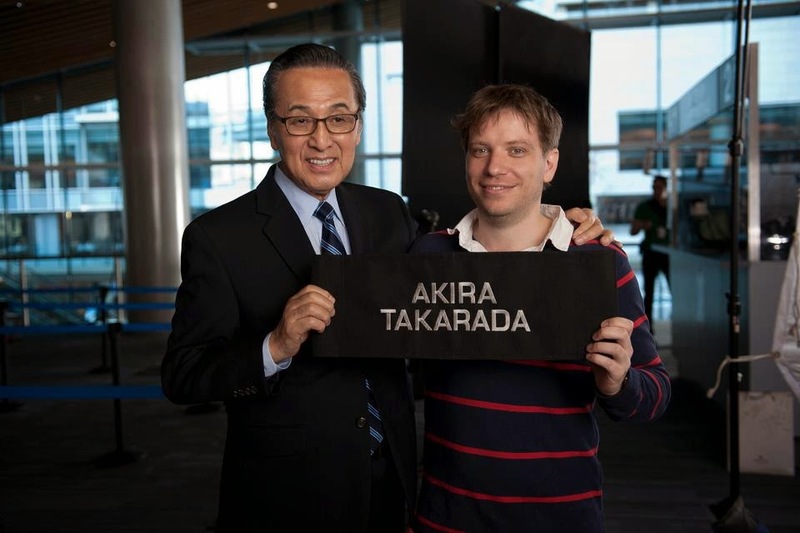 Of the two American interpretations of Japan's most famous cinematic export, Gareth Edwards is the most Japanese friendly of the two. 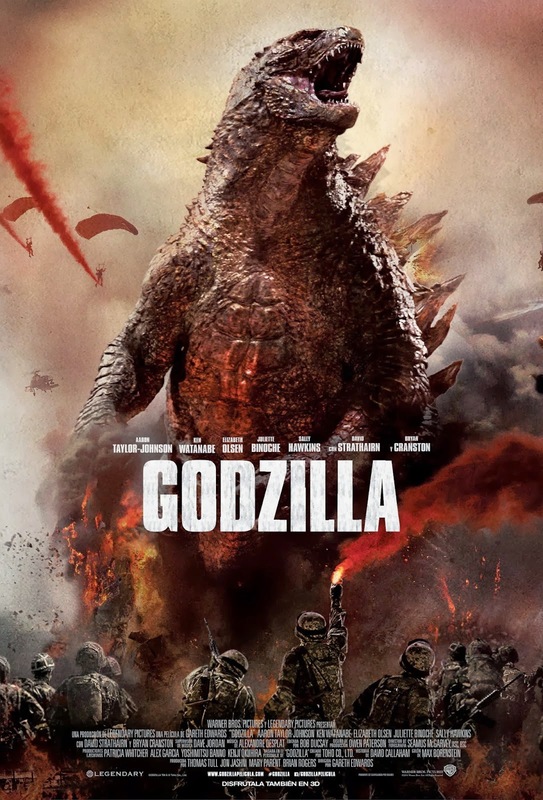 Award winning composer Alexandre Desplat never echoes Akira Ifukube at any point in the movie, but delivers a bombastic score just as big and explosive as the monsters and the ensuing rampage. His score grabs your attention right from the start, and only excels from there. Thankfully, above all else, an American studio finally got Godzilla right. Unfortunately, it's a bit on the talky side opting to feature its creatures to a lesser degree. 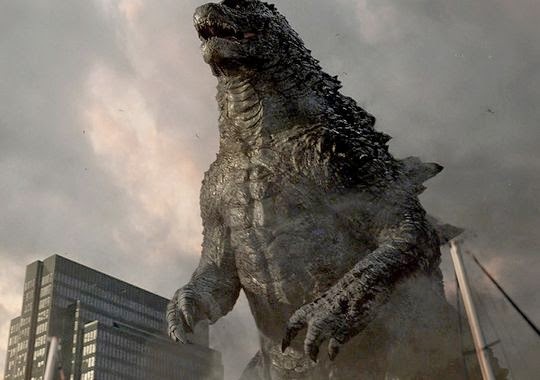 Since the film has, as of this writing, surpassed its budget with Godzilla gobbling up approximately $200 million already, hopefully the filmmakers will see fit to give the big guy some feet for the inevitable sequel. Is GODZILLA (2014) recommended? Of course it is. Not only does it summarily destroy the memory of that '98 nonsense, but it does a good many things right, it just takes a long time to get to them.